(1909-1968) Virginia Lee Burton was born in Massachusetts to an artistic and fun-loving family. When she was a teenager, her family moved to California for her mother’s health, where, after finishing high school, Burton remained to study art and dance. Shortly thereafter, though, she returned to Massachusetts, where she spent the rest of her life in the Folly Cove area of Gloucester. In artistic partnership with her husband, sculptor George Demetrios, (with whom she had two sons) she founded the Arts and Crafts movement-inspired Folly Cove Design cooperative. Burton’s artwork celebrates sophisticated but homespun design, and most of her seven books deal poignantly with the encounter between older ways of life and encroaching impersonal technologies and development. 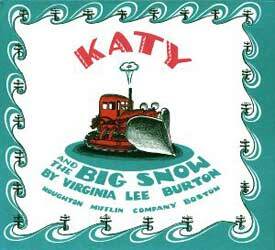 Harriett's childhood favorite was Katy and the Big Snow. Special mention also to Mike Mulligan, whose steam shovel's name is the same spelling as our favorite Mary Anne, book grandma, with almost a dozen grandchildren enrolled in our Loganberry Book Club. 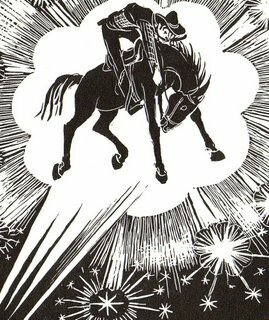 * Calico the Wonder Horse or The Saga of Stewy Slinker, 1941. * The Little House, 1942. * Katy and the Big Snow, 1943. * Maybelle the Cable Car, 1952. * Mike Mulligan and His Steam Shovel, 1939. * Life Story: The Story of Life on Earth from Its Beginnings Up to Now, 1962. * The Emperor’s New Clothes, 1949. By Hans Christian Andersen. Retold and illustrated by Virginia Lee Burton.